To extract value from an ever-growing onslaught of data, your organization needs next-generation data management, integration, storage and processing systems that allow you to collect, manage, store and analyze data quickly, efficiently and cost-effectively. That’s the case with Dell™ | Cloudera® Apache™ Hadoop® solutions for big data. These solutions provide end-to-end scalable infrastructure, leveraging open source technologies, to allow you to simultaneously store and process large datasets in a distributed environment for data mining and analysis, on both structured and unstructured data, and to do it all in an affordable manner. 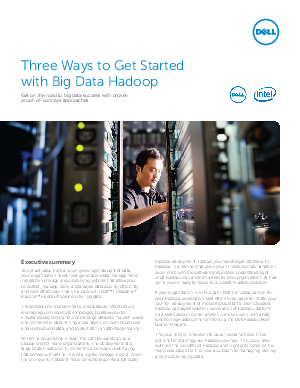 This business-oriented white paper explains three options for starting your Hadoop journey. This paper also outlines the benefits of Hadoop and highlights some of the many use cases for this new approach to managing, storing and processing big data.